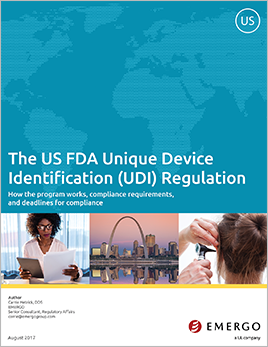 If you want to sell your device in the USA, you probably have questions about the Unique Device Identification (UDI) regulation. The FDA implemented the regulation in 2013 and compliance is mandatory. The basic premise of UDI is simple: to generate a number attached to each medical device for quick identification. However, implementation is complicated. In this white paper, we answer your biggest questions about the the basics of the regulation, compliance requirements, and how the programs works. What products are exempt from marking directly on the device? How could date format changes create challenges for my company? What are the components of a UDI? How to obtain the UDI number? When does a change to a device require a new UDI number? When are the compliance deadlines? We answer all of these questions and more in this 6-page white paper.